I have faint memories of a neighbor woman down the street from our house in Northern California sharing great bundles of homegrown rhubarb with our family when I was quite wee. That was approximately 300 years ago, and I don’t think I’ve heard much about rhubarb since. I suppose smarter people than I have expounded on why this sour vegetable has fallen out of favor, but if I were to hazard a guess, I might lay the demise of its popularity at the feet of our sweet-obsessed culture. Rhubarb, whose edible stalks sort of look like rosy celery, is tart. Extraordinarily tart. Think Granny Smith apple times 100. 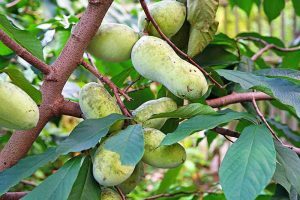 This vegetable/fruit (hang on – we’ll explain in a minute) is almost never eaten raw. It’s often baked into a pie or cobbler with something close to five pounds of sugar. Okay, just kidding, but you get the point. The truth is, those who aren’t in the known about this stalky homegrown treat are missing out. And you, too, can grow it in your own garden. 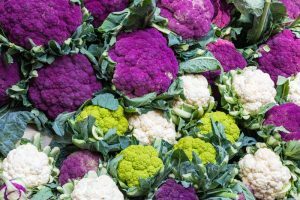 Let’s take a look at the best methods to grow it, and some delicious culinary suggestions for getting the most out of your harvest. 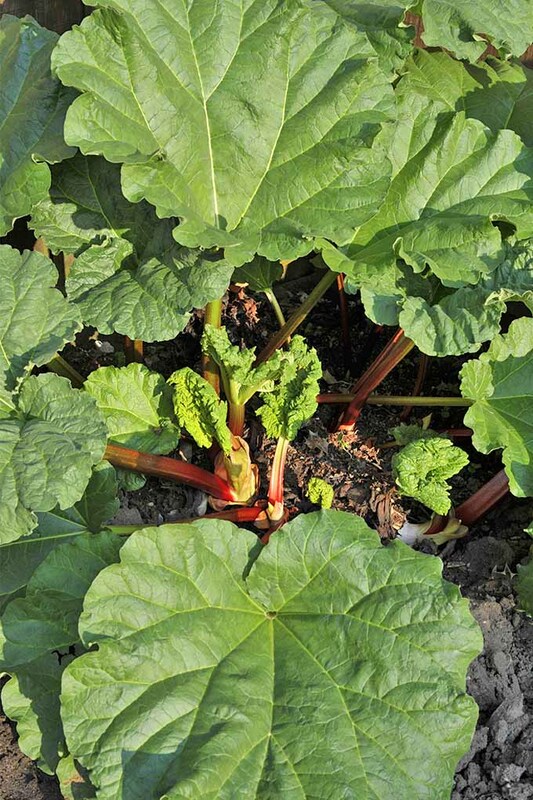 Botanically a vegetable, rhubarb is often referred to as a fruit because, culinarily, that’s how we use it. 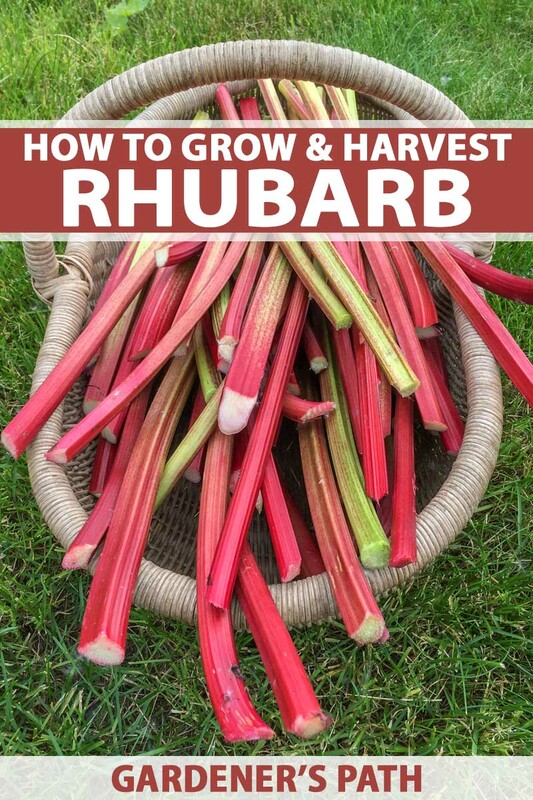 Apparently, the US Customs Office even legally declared rhubarb a fruit in the 1940s — something to do with import taxes and that’s basically how it was used in cooking anyway. But again, technically it’s a vegetable. This plant’s leaves are poisonous. Way poisonous. So don’t eat them. 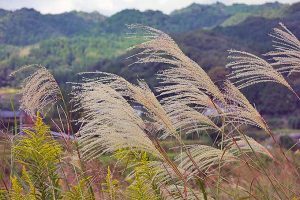 As soon as you harvest the stalks, cut the leaves off and throw them away where neither human nor beast can get to them. 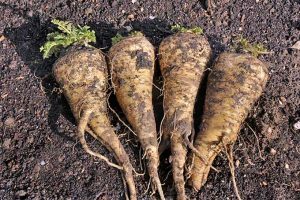 The root and rhizome of the plant are okay to ingest, however, and have been used as a medicinal plant in Asia — where it is native — for around 5,000 years, if not longer. 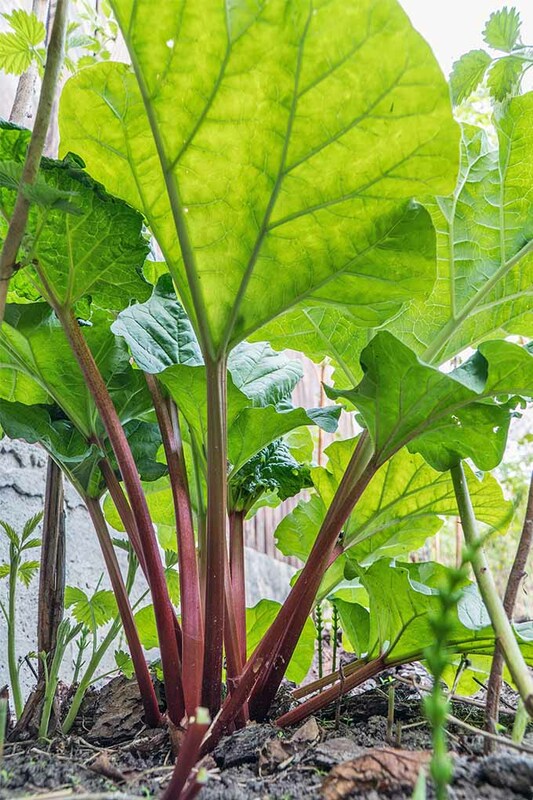 In fact, modern natural-medicine adherents around the world sometimes use rhubarb to address digestive issues such as constipation, diarrhea, and heartburn. 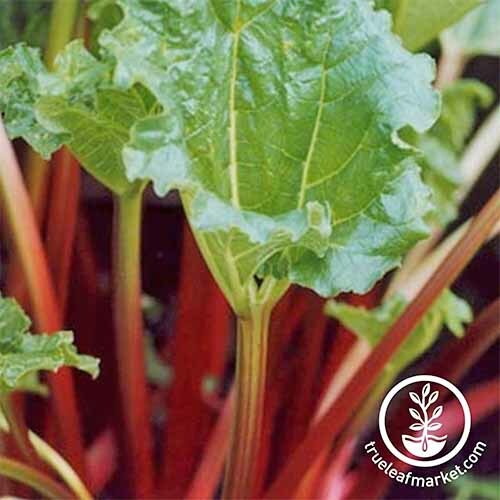 Rhubarb is also used by some to treat cold sores. Hardy and treated as a perennial in zones 3-8, gardeners in southern zones sometimes have luck growing R. rhabarbarum as an annual, though our brutal heat can make it tough to get a harvest in before the plants burn up. 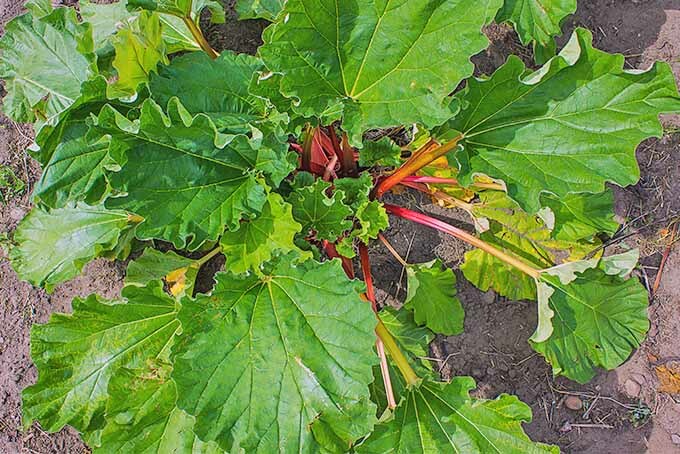 Rhubarb, aka “pie plant,” also needs extended temperatures below 40°F during the cold season, which some Southern zones just don’t get. 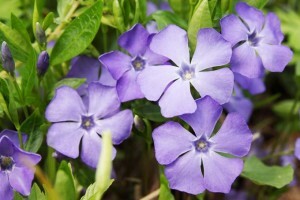 Though it won’t typically survive multiple seasons in southern climes, it can be grown as a winter annual in the south. 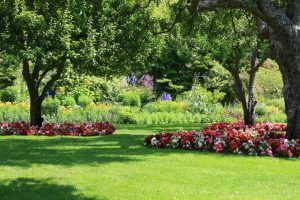 Be sure to give plants extra protection from the summer sun in these areas, and plant in an section of the garden with afternoon shade. 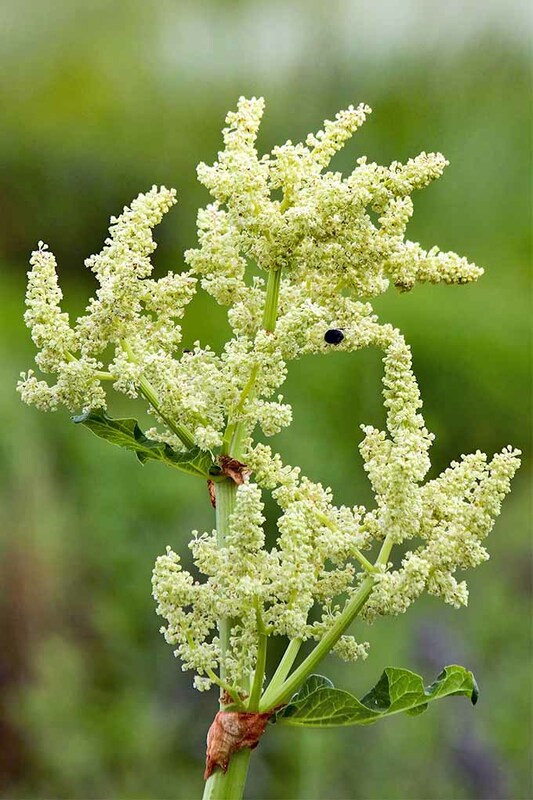 This plant grows to 2 to 3 feet tall and spreads 3 to 4 feet. 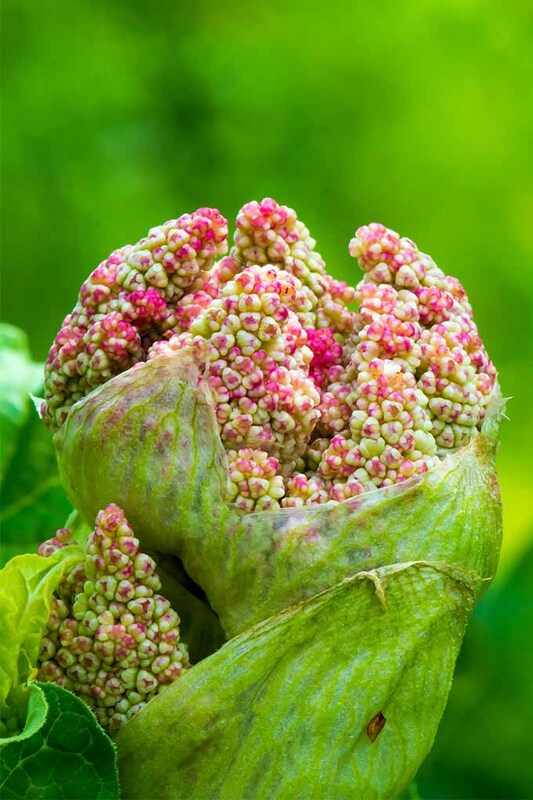 On up to 5-foot stalks, the plant produces flowers that, in their nascent stage, resemble pink-tinged cauliflower. They gradually unfurl into great clouds of white. 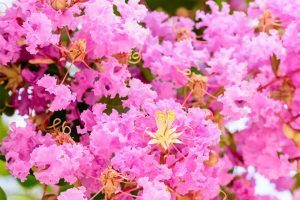 While it is generally recommended to cut off flower buds to increase stalk production, some gardeners opt to allow the flowers to bloom, for beauty’s sake or to eat, as the flowers are edible, too. If you want to add R. rhabarbarum to your garden, your best bet is to “borrow” a crown from a neighbor, or purchase a small plant. 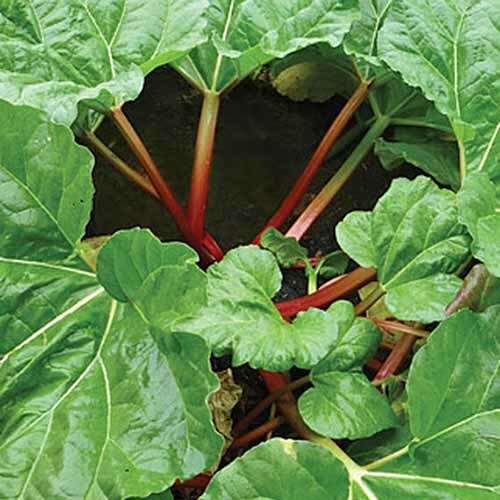 Since plant division is typically not an option in hotter regions where rhubarb cannot be grown as a perennial, it must be grown from seed in these USDA Hardiness Zones. Don’t be concerned if the resulting stalks are more green than red – even though this plant is a bit like apples and other food crops that don’t grow true to the original cultivar from seed, they’ll still be delicious. 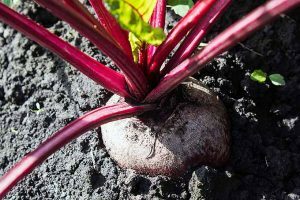 Extra-large ‘Crimson Red’ roots are available from Burpee. With plump, tender, sweet and tart stalks that max out at 24 to 36 inches, this is a non-stringy variety that’s winter hardy. ‘Crimson Red’ does best in USDA Hardiness Zones 3-8. Another excellent option is ‘Chipman’s Canada Red.’ This cultivar is said to have a sweeter flavor than some other types. Live plants in #2 containers are available from Nature Hills Nursery. If you’d like to try your hand at cultivating some heirloom seeds, consider the open-pollinated strain ‘Victoria,’ available via True Leaf Market. 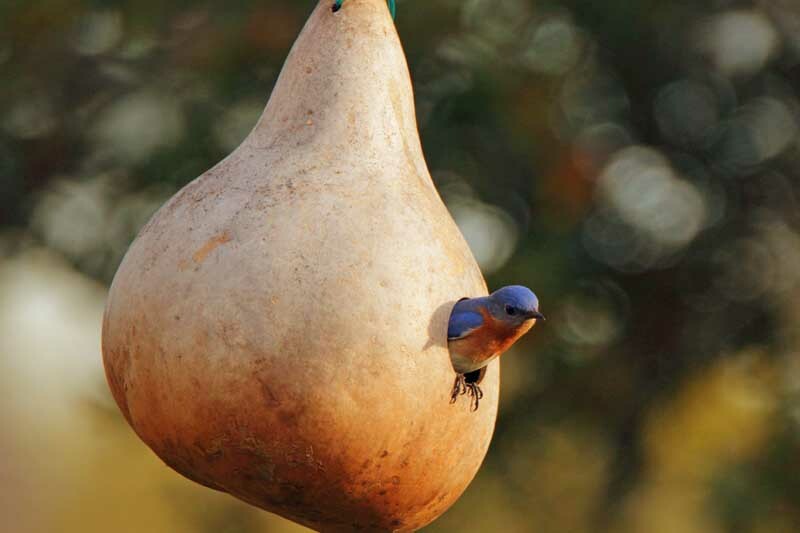 You’ll get a packet of 500 seeds that produce heavily. Packages of 2 roots or 6 ‘Victoria’ live plants are available from Burpee, where this cultivar is known as a customer favorite that’s excellent for cooking, with a sweet, mild flavor. The stalks are more green and less red than other cultivars, more of a blush color, and these plants do well in zones 3-8. 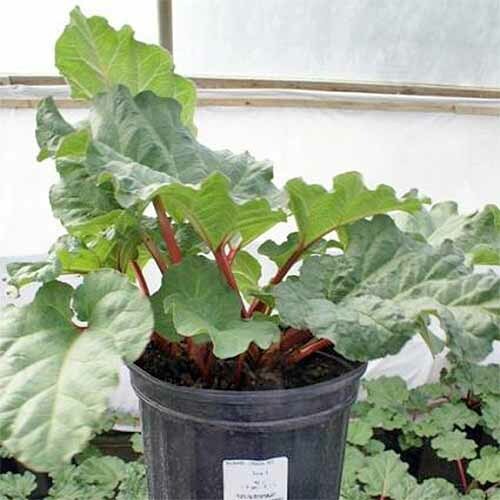 A heavy feeder, rhubarb likes well-drained, deep, fertile soil that’s high in organic matter. Soil with a pH of 5.5 to 6.5 is best. It will tolerate some shade, but produces the best yields in full sun. And it likes plentiful, consistent moisture. If drainage in your intended planting zone is less than ideal, plant each R. rhabarbarum seedling in its own little hill, so water drains away from the crown. 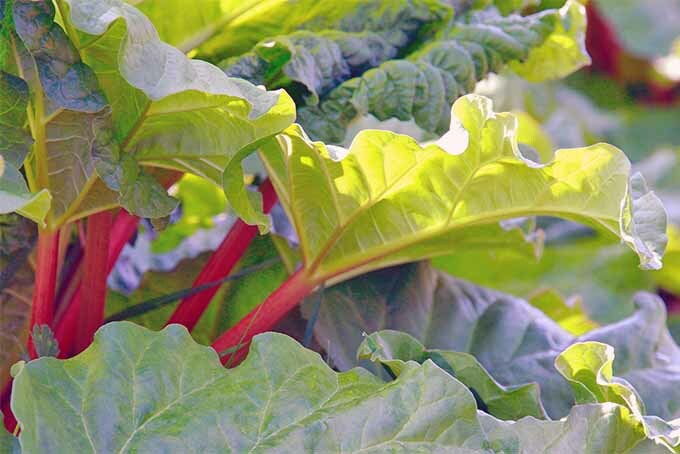 In its intended zones with cooler winters, rhubarb should be planted in the springtime. Sow seeds indoors 8-10 weeks before the average last frost, after soaking them in water for a few hours. 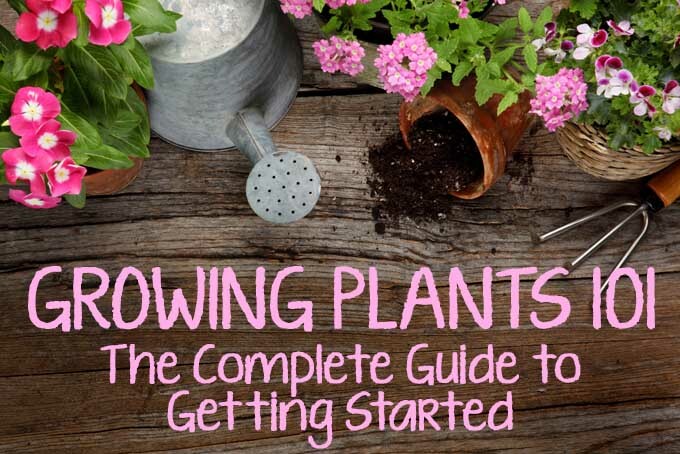 Southern gardeners who wish to grow seeds should plant them indoors in mid- to late August. 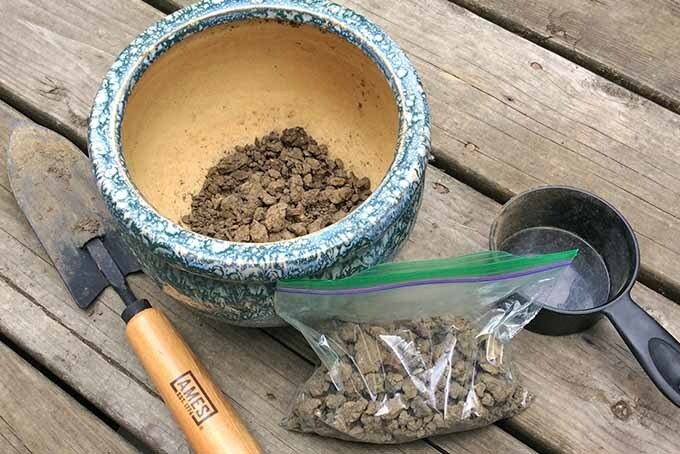 Place two seeds to each pot, ¼-inch deep in 4-inch pots filled with a good potting or seed-starting mix. Keep them indoors at room temperature until they sprout, and then move them to a bright window. When the seedlings reach 2 inches tall, move them outdoors to a shady location to begin to harden off. 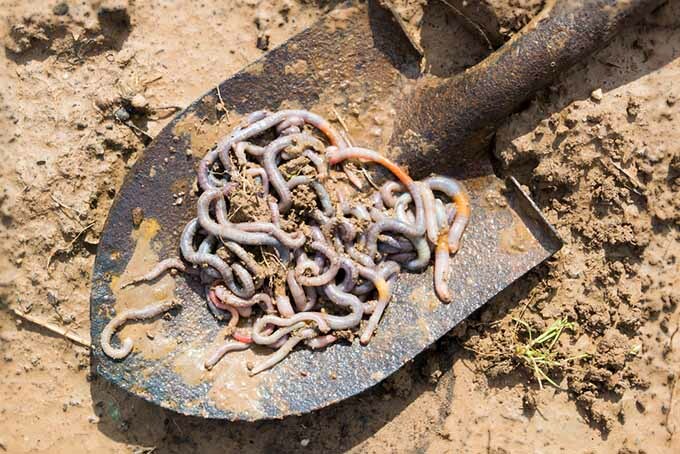 Keep the soil moist, but not soggy. After a couple weeks, move them to a brighter location with morning sun. They can be transplanted to a sunny spot in the garden when they’re about 4 inches tall and have three to five leaves each, after the risk of frost has passed. In hotter southern zones, this should be done in late September or early October. 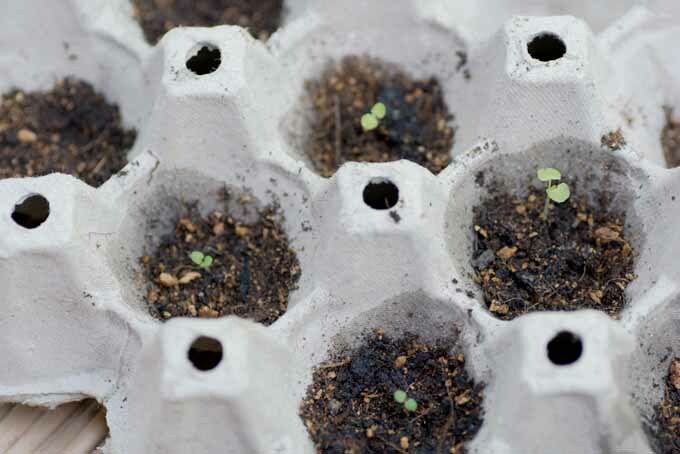 Potted seedlings should be transplanted at the same depth at which they are growing in their pots. Plant bare-root crowns 1-2 inches below the soil surface. Space plants 3 feet apart, so they will have room to spread. 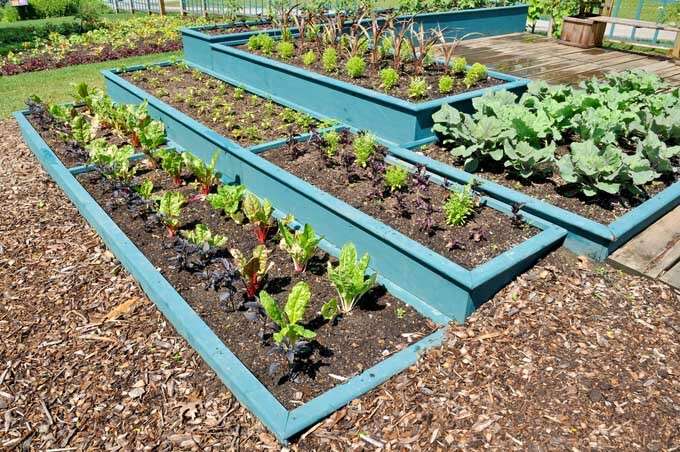 Whether you plant in the spring or fall, add a thick layer of mulch to the growing area. Oh, and some gardeners have had luck growing this veggie in containers as well. So that’s something to consider if your landscape is full up, or otherwise unsuitable. You’ll want to start with a fairly large container, and plan to divide often. R. rhabarbarum appreciates constant moisture, but doesn’t want soggy soil. If you live in the Pacific Northwest, no supplemental water will likely be required. Southerners will have to engage the irrigation system regularly to keep the moisture consistent. 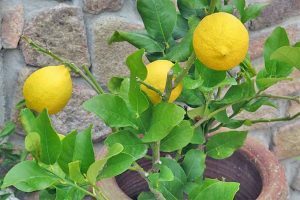 Early in the plants’ second spring, apply ½ cup of 10-10-10 fertilizer in a circle around your plants, taking care not to apply directly to the crown, which can burn it. 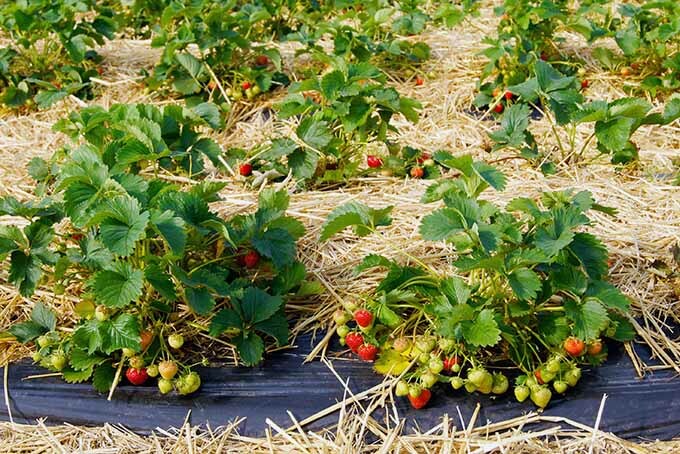 Apply the same fertilizer after growth starts, and a final time after harvest. Rotted manure also makes a great fertilizer for R. rhabarbarum. 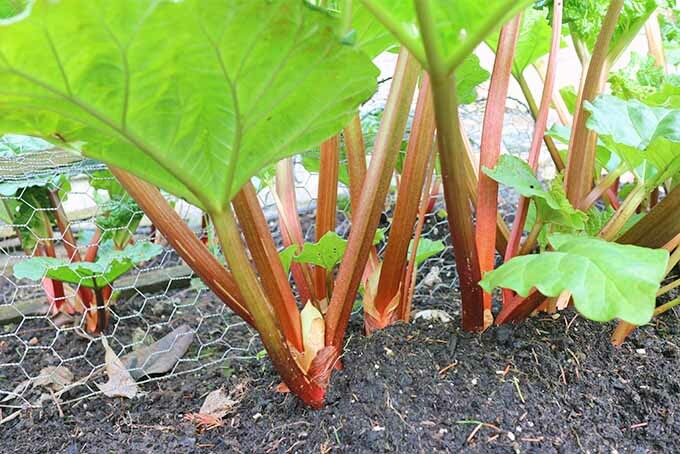 Dig and split rhubarb roots every 3 to 4 years. Divide when plants are dormant in early spring (or fall). R. rhabarbarum is fairly free of pests and diseases, though there a few to keep an eye out for, including rhubarb curculio. 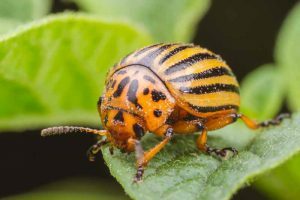 This half-inch-long beetle should be handpicked from plants when spotted. 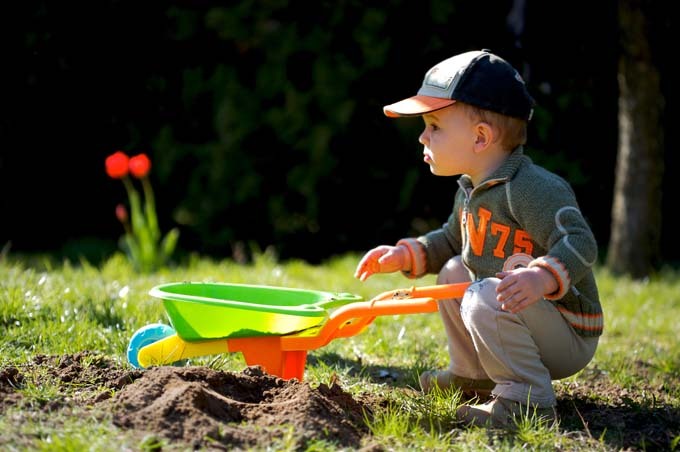 Or sprinkle diatomaceous earth around your garden beds. If you see mites, treat them with neem oil, such as this one from Bonide that’s available via Amazon. Bonide Neem Oil, 32 Oz. This 32-ounce spray bottle is ready to use. You may encounter fungal leaf rot. 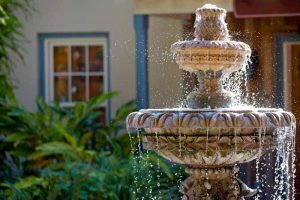 This can happen if the plants’ leaves remain wet for too long, or if plants are too crowded, with poor air circulation. 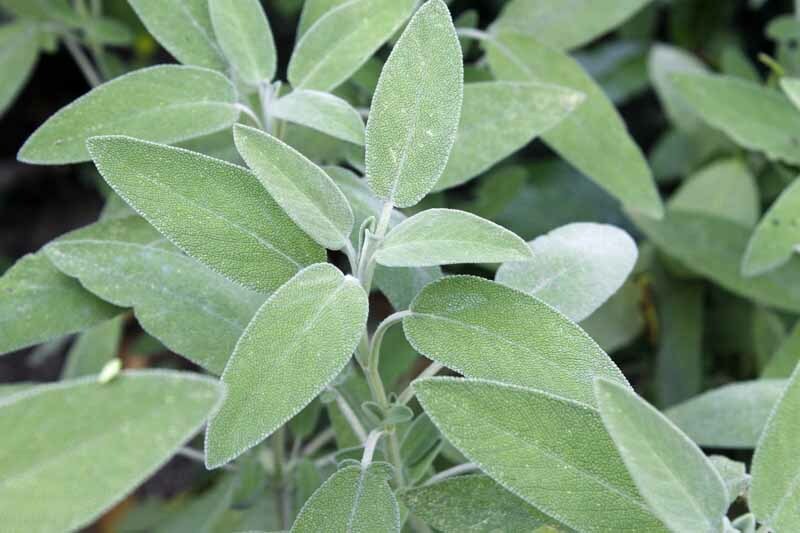 Generally, only the leaves are impacted, not the stalks. Harvest stalks with impacted leaves first, and carefully remove and dispose of the leaves so as not to spread the fungus. Phytophthora crown rot can occur if the plants’ subterranean bits sit in too much water for too long. Planting in hills, as mentioned above, can help prevent this problem. 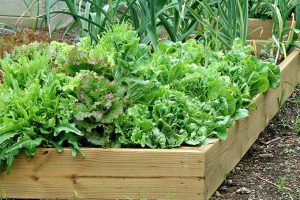 To avoid introducing rot or fungal growth, be sure to plant in well-draining soil, and water at the base of plants rather than sprinkling the leaves. Watering in the morning can be helpful as well. Most experts say it is best to wait to harvest stalks until the second or third year of growth. Choose stalks that are at least 10 inches long, and take care to not harvest all the stalks from a given plant at once to avoid stressing the plant. Let some leaves remain on perennial plants in the summer to generate energy for the next year’s growth, the same way you would let the leaves on daffodils be in preparation for the next year. 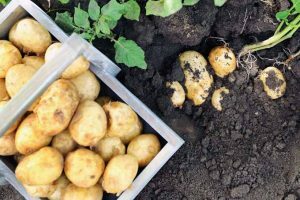 All stalks can be harvested from annuals when the heat of the summer begins to set in, and crowns can be disposed of in the compost pile after your last harvest. When it is time to harvest, grab a stalk and pull sideways — it should break off easily. Or you can cut the stalks off with a clean knife. Immediately cut off the leaves and put them in the compost bin (unless they are diseased — in that case, seal them in a bag and dispose of them). You can store cut stalks in the refrigerator for up to two weeks. Wrap them in plastic, and for best results, stand them up in a container of water — much as you would fresh herbs — to keep them hydrated. 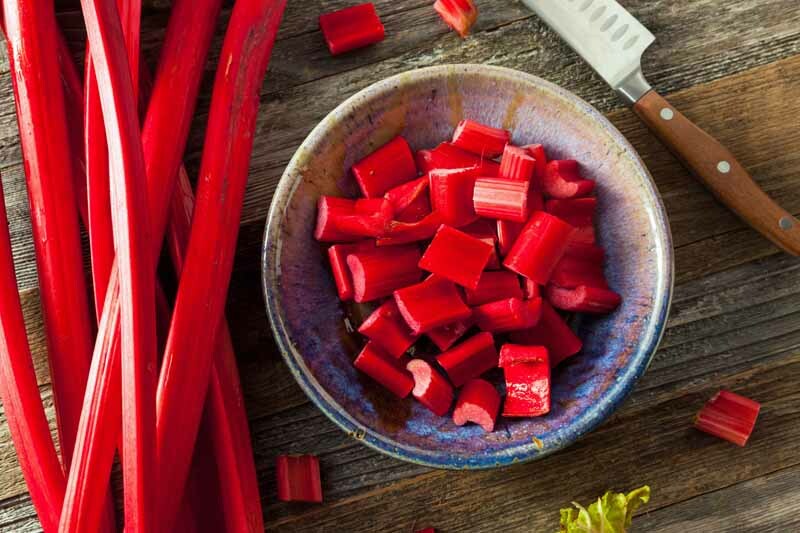 Rich in vitamin C and dietary fiber, rhubarb is not only delicious in a tangy, tart, and sour kinda way, but it is healthful, also. 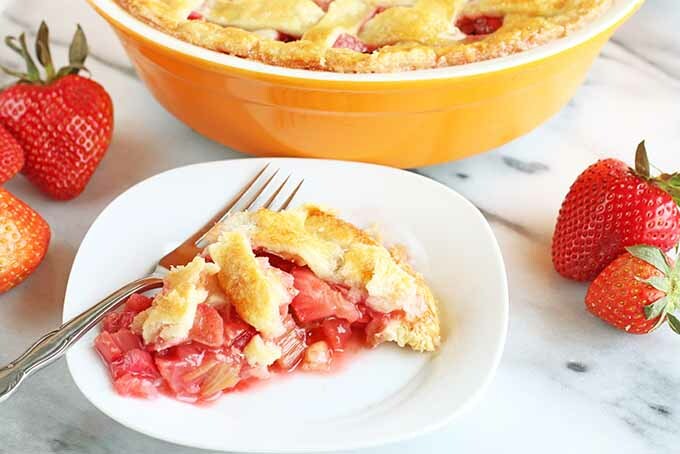 When looking for ways to use this vegetable in the kitchen, we must absolutely consider the classic strawberry rhubarb pie, such as this one from our sister site, Foodal. Sweet and sour, it has an old-fashioned flavor that deserves a place on the modern table. Photo by Meghan Yeager via Foodal. 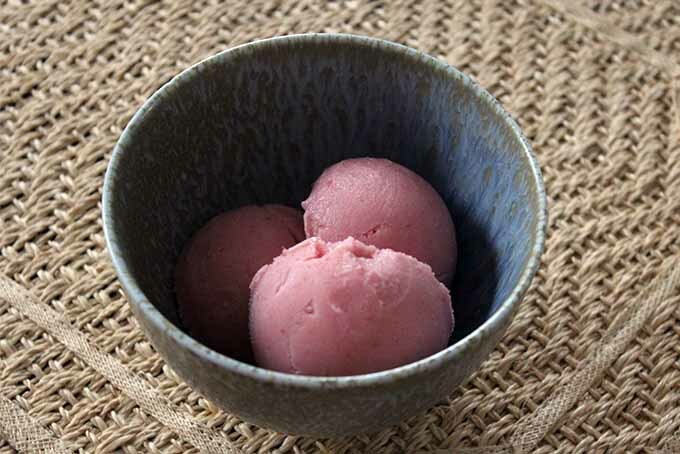 Also from Foodal comes a mouthwatering rhubarb buttermilk sherbet, also starring the unmistakable flavor of rhubarb. Photo by Kendall Vanderslice via Foodal. If you’d like a refreshing beverage featuring this tart delight, check out this recipe from The Fitchen for rhubarb mint pink lemonade. You can even grow your own mint for this one! For a savory course that features rhubarb, how about these barbecue pork ribs with rhubarb chutney from Sugar Love Spices? For even more rubbard recipes, check out all that is available over on Foodal. Far less complicated than the fancy recipes above, my mom usually just made a crumble with our neighbor’s generous bounty. But it was absolutely scrumptious. Consider growing your own deliciousness. Make sure the plants have enough water, a little fertilizer, and divide them every few years. 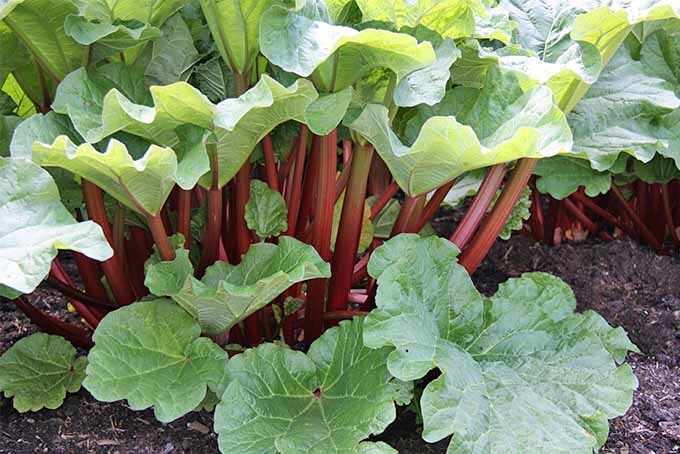 You’ll have enough rhubarb to make plenty of pies, and also be able share a large bundle of stalks with the young neighbor girl down the street. Have you ever grown this fruit-vegetable? Tell us about your experience in the comments section below, and if you’d like tips on growing another oft-mislabeled fregetable/vruit, read up on tomatoes here. Photo by Gretchen Heber © Ask the Experts, LLC. ALL RIGHTS RESERVED. See our TOS for more details. Product photos via Growers Solution, Mountain Valley Seed Company, Nature Hills Nursery, and Bonide. Uncredited photos: Shutterstock. Originally published by Mike Quinn on September 29th, 2014. Last updated on May 4th, 2018 with additional writing and editing by Allison Sidhu. 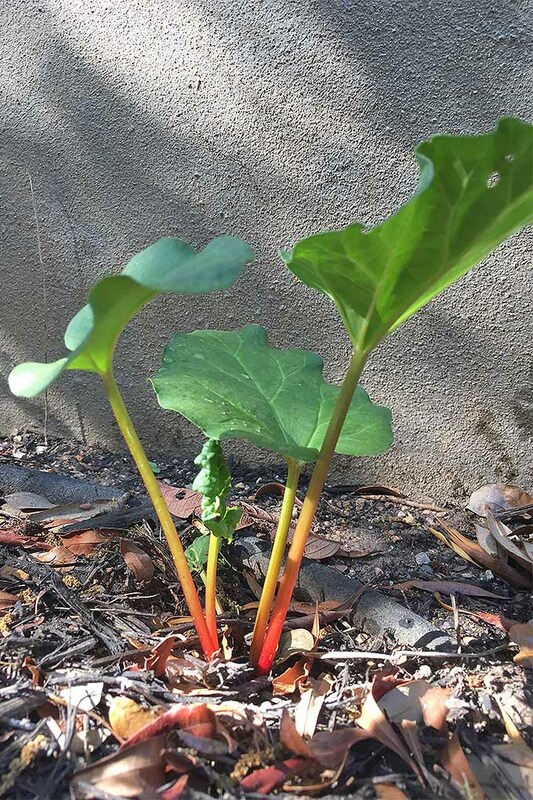 Wow, I have never grown rhubarb before and just never thought about it. However, you were very convincing that I need to try it out. It is a stunning plant as well. 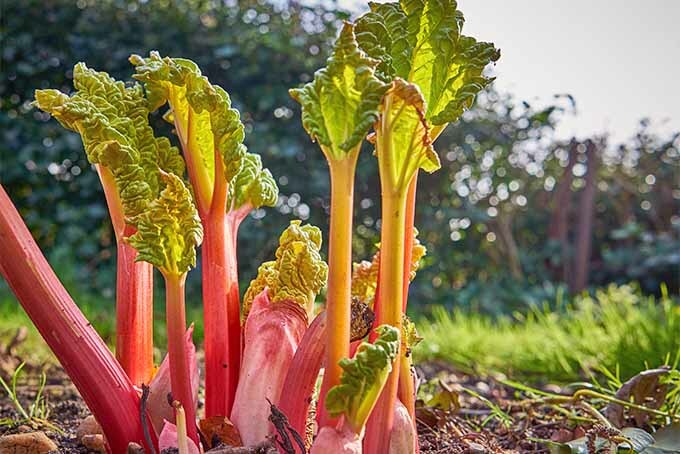 Back in 1974/75 Organic Gardening publication advised to dig in wood ashes from the fireplace into to soil for planting rhubarb crowns. The claim was that it would both provide potasium and aid in prevention of winter rot of the crown when winter is overly wet, cold or long. I did this last year along with homemade compost for a 3 year old crown gifted to me by a co-worker. The crop was so bountiful it supplied the neighbors, my coworker and I rhubarb from late spring through December. I am so glad to find this article. 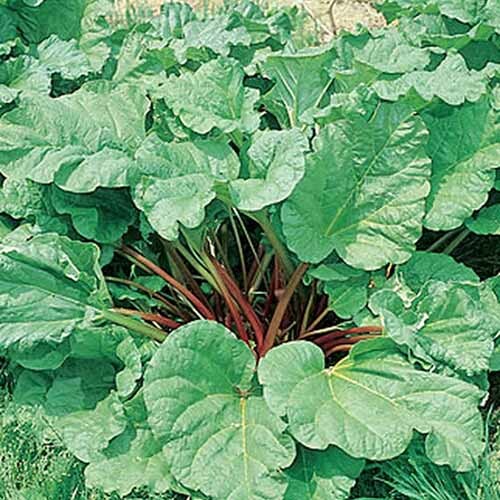 The rhubarb plant I ordered last fall has just shipped and I want it to grow well. We always had it growing in our back garden when growing up in Ireland. As kids we would eat the stalks raw just dipping them in the sugar bowl. Last year I found some at our local Tom Thumb and introduced it to the hubby and our grown kids. I have a greenish/yellowish bulb growing out of the middle of my rhubarb plant. What is it and should I not disturb it? Can’t say for sure, Karen, but it sounds like this is the beginning of a new stalk. Our best advice is to wait and see what happens, and let it grow! Hard to say without seeing what you’re referring to, though. Feel free to send a picture.